Solar energy is the most common type of off-grid energy source currently in use, and solar energy driven household items are fast gaining grounds for those who want to break the mould and take control of the home electric supply. We all probably have or had in our lifes some solar-powered calculators, one of the most popular devices that use solar power to work (though we didn’t use them in the daylight, but rather under a desk lamp). Simple solar power driven items like solar powered electric charger for small devices like cell phone and other USB devices like iPod are available over the internet retail stores like the Amazon and eBay. 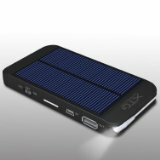 For instance, here is the solar powered battery charger that is available from Amazon. The use of such solar powered household items is money savings strategy in many ways. First, you save money by going off the grid and not paying for the regular electric supply as the sun is a free source of energy. Second (remember when you file taxes online) some national and local governments are encouraging the use of solar powered household items by implementing tax breaks for those who choose to go solar at their home. Not only solar cells, but basic wind turbine units can also be set up readily at home. All you need is to do some initial research and find the required off energy power source from the internet and then have it installed at your home. You will be surprised at how much savings you are getting on the long run. In fact, any appliance that runs on the electric supply at home including the TV, computer, or alarm monitoring service can be run by using an off the grid power source like the solar or wind power. But if you want my advice, start with using the off-grid power for essential loads like water pump, refrigerator, central heating water pump or hot air fan. Grid-independent power supply would mean both savings and increased supply security. You wouldn’t end up with no water in cold house in winter when the local energy grid is for some reason broken. One Response for "Saving energy and money with off-grid household items"